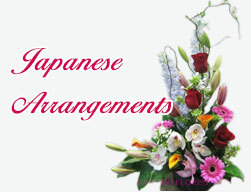 JAPA025 Sympathy Japanese All White Medium [JAPA025] - $125.00 : Hanamo Florist Online Store, Vancouver, BC, Canada, Quality arrangements using a plethora of the freshest flowers. This sample shows the medium size which is the home size. For the funeral/memorial service the large size at $175.00.is recommended.